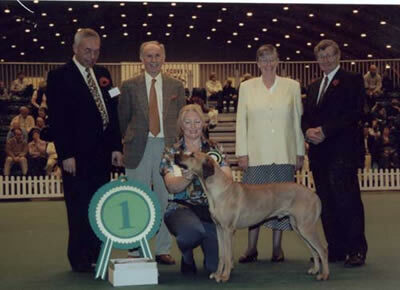 16 December 2001 - Jeff Horswell judged Ridgebacks at the South Yorkshire Hound Show where he gave Kip BOB. He also judged BIS and gave Kip the top placing. "Open Dog: Craigie's CH Imbali Kipenzi, cracking looking dog, great head & overall shape, lovely rearquarters, stood & showed for all he was worth." Mr. Ole Staunskjaer (Treasurer of the Danish Kennel Club) judged all the Groups and BIS. Kip was one of the 8 hounds shortlisted in the Group. 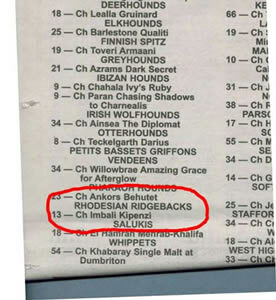 November 2001 saw Kip (CH Imbali Kipenzi JW) gracing the front page of Dog World as he won the Kennel Gazette's Junior Warrant Finals at Discover Dogs in London. Kip qualified under Mr. Andrew Brace. The Semi-final judge was Mr. Albert Wight and the finals were judged by Mrs. Ferelith Somerfield. Their reports are shown below. Mr. Albert Wight - "The Rhodesian Ridgeback, CH Imbali Kipenzi JW, stunning example of the breed and for me an easy winner. A classy dog, beautifully headed and bodied, wonderful condition and muscle tone, seldom puts a foot wrong in stance and in circling the ring is quite dominant with his free flowing action. Mr. Quinney and I were equally delighted when Mrs. Somerfield made him the overall winner". Mrs. Ferelith Somerfield - "One more round of the ring and it was the Ridgeback, who looked superb throughout and who dominated the ring, who took first place". For those who don't know how a dog qualifies for a Junior Warrant I will try and explain. Dogs have to accrue 25 points between the age of 6 and 18 months at both Open and Championship shows. A minimum of 12 points must be won at both types of shows and only a total of 25 points count regardless of how many points are won in total. A "first" at an Open show scores 1 point and a "first" at a Championship show scores 3 points but there must be three or more dogs present in the class. Three clear days have to pass between each qualifying show. For example, a dog entered in two Open shows on one weekend and who wins classes at both would only be allowed to use the points won from one of those shows. If there are less than three dogs in the class and the dog wins, it would not gain any points unless the dog also wins BOB when it is awarded 1 point. This is a recent change to the rules. Prior to this change Kip won BP, BOB, Group 1, Group 1 Puppy and RBPIS at one particular show but, as there were only two puppies in his class present on the day, HE DID NOT GET A SINGLE POINT! Dogs who gain their Junior Warrant are then eligible to compete at qualifying shows for the Kennel Gazette's Junior Warrant Finals competition which is held at Discover Dogs each November. A maximum of 64 dogs can enter on a first come basis at the qualifying shows, 5 go forward to the Finals. Unsuccessful dogs can try again at another qualifying show. On the day of the Finals a draw takes place to decide which of the 64 dogs is judged by one of two semi-final judges. Each judge assesses the dogs and draws out 5 to go forward to the Grand Final. A third judge then assesses the final 10 dogs and makes a shortlist of 4. From this 4 a winner is selected. Kip is the first Ridgeback to have won this event.